The problem is that growth is not meeting expectations. The chart below summarizes the growth in revenue per user. On average in the third quarter, each person using Snapchat daily generated $1.17 in revenue for the company. As a point of comparison, Facebook in the same period generated an average of $7.67 in revenue for each of its more than 1.3 billion daily users worldwide. In addition to low revenue, analysts are worried that the company may not have a sufficiently large market opportunity to justify a lofty valuation. The company faces two major hurdles to growth. First is the fact that ads must be custom made for Snapchat. The company’s requirements are unique, complicated and expensive, which limits the potential pool of advertisers. Only large companies or startups with large ad budgets are able to justify the expense. The startups looking at Snapchat for ads are seeking to benefit from what other companies view as the companies second hurdle to growth. Snapchat’s audience is limited to a younger demographic. This is fine for some companies, but many products will not benefit from advertising on the platform. There are two ways to interpret this statement. Being willing to change could be bullish for the company. The company’s product does have limited appeal both to its potential users and to advertisers. Changes could increase the size of the audience and the revenue from advertisers. Or, the change in direction indicates the company was not ready to be a publicly traded company because its product requires major reworking. There is a possibility Snapchat could end up losing existing users and failing to attract new users. Traders are reacting to the news by selling, an indication they believe that the company may not be on the right track yet. As the chart above shows, the stock has been locked into a down trend since its initial public offering. The stock’s price is more than 55% below its high and there seems to be no reason to expect a turnaround in the short term. By announcing that they will be changing their product, investors are left wondering what the CEO means. They don’t know if the changes will SNAP more or less appealing to users or advertisers. All they know is their current financial models need to be reworked, most likely reflecting less revenue. For now, that means the stock is likely to fall or in a best case be dead money where the price remains in a relatively narrow trading range for at least the short term. The short term, in this case, is likely to last until the company provides more detail on its redesigned platform. 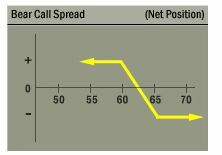 Fortunately, options strategies can be used to benefit from the expected price action. To benefit from weakness, an investor could buy put options. But, as the chart shows, SNAP has been in a downtrend and that has resulted in increased volatility. The higher volatility increased options premiums even more. This is normal behavior when a sell off occurs. For SNAP, we have a number of options available. Short term options allow us to trade frequently and potentially increase our account size quickly. In this case, we could sell a November 17 $13 call for about $0.50 and buy a November 17 $13.50 call for about $0.30. This trade generates a credit of $0.20, which is the difference in the amount of premium for the call that is sold and the call. Since each contract covers 100 shares, opening this position results in immediate income of $20. The credit received when the trade is opened, $20 in this case, is also the maximum potential profit on the trade. The maximum risk on the trade is about $30. The risk is found by subtracting the difference in the strike prices ($50 or $0.50 time 100 since each contract covers 100 shares) and then subtracting the premium received ($20). This trade offers a return of more than 67% for a holding period that is less than two weeks. This is a significant return on the amount of money at risk. This trade delivers the maximum gain if SNAP is below $13 when the options expire, a likely event given the stock’s trend. Call spreads can be used to generate high returns on small amounts of capital several times a year, offering larger percentage gains for small investors willing to accept the risks of this strategy. Those risks, in dollar terms, are relatively small, about $30 for this trade in SNAP.